A Memorandum of Understanding (MoU) was signed, yesterday, to recruit more Bhutanese job seekers in private companies. 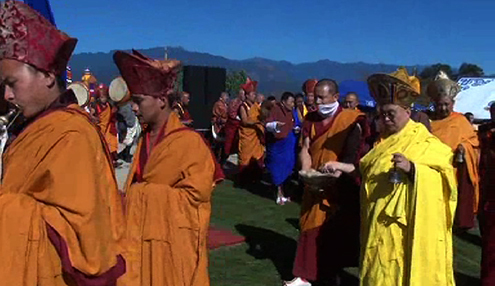 His Holiness the Je Khenpo is in Pema Gatshel to conduct the third Moenlam Chenmo or the great prayer ceremony. His Holiness arrived yesterday. The Dzongkhag and local government officials received His Holiness the Je Khenpo. The Bhutan Archery Federation (BAF) is in the process of choosing two women archers to represent Bhutan at the international competitions. They will be chosen from within the age group of 16-23, from the ongoing Winter Coaching Camp. Monggar Dzongkhag emerged the winner of the National Taekwondo Championship, which was held in the capital, over the past two days. The Dzongkhag received a cash prize of Nu.20,000.